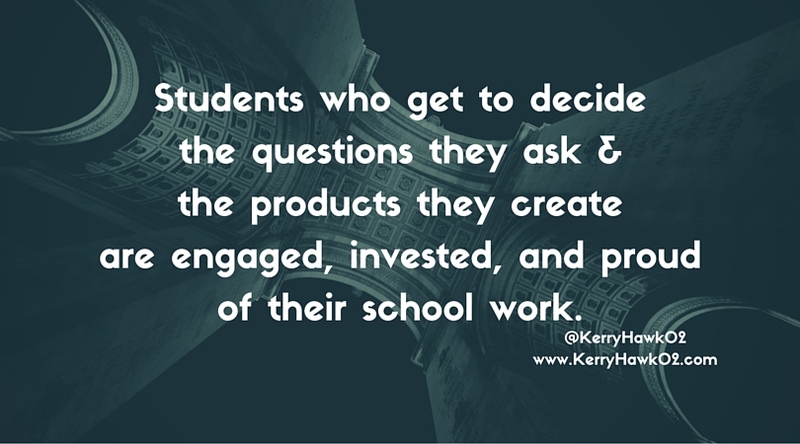 Students who get to decide the questions they ask and the products they create are engaged, invested, and proud of their school work. Student-driven project based learning can make this dynamic possible in any classroom. Not every lesson or project in every class needs to take this form. Maybe reserve it for the big stuff. If every culminating end-of-unit or end-of-quarter activity is PBL, students will leave your class feeling as though they own their knowledge and know how they will use it moving forward. Most learners are accustomed to being given directions, following them step-by-step, and producing a project that looks incredibly similar (or identical) to a model. In a traditional classroom, the teacher plans the project and the students make it. In a personalized PBL classroom, the students do it all. My favorite resource for defining and explaining personalized learning is Make Learning Personal from Bray and McClaskey. I especially love their table that clearly defines the differences between personalization, differentiation, and individualization. When talking with students about how they should shape their learning experience, showing them this table can help clarify things. 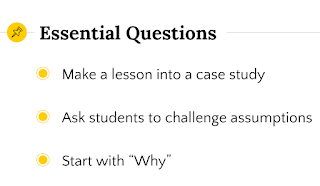 Good teachers develop the skills to create these questions themselves, but the best teachers help their students craft these types of questions. 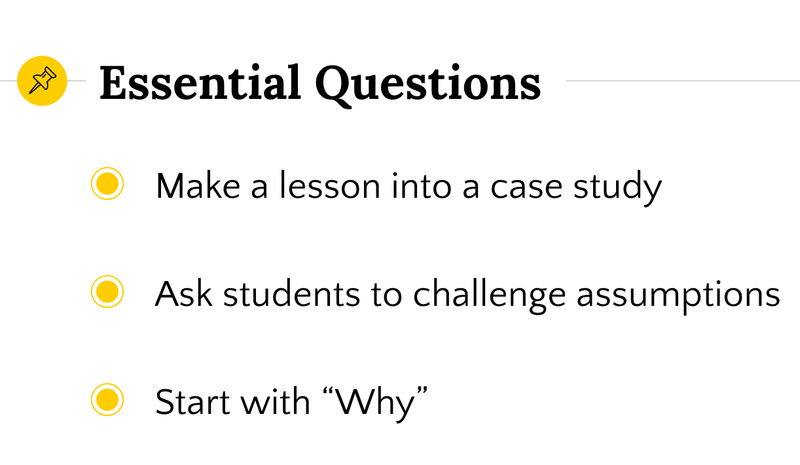 Give students the standards or learning goals they have to meet, then guide them as they develop their own essential questions. 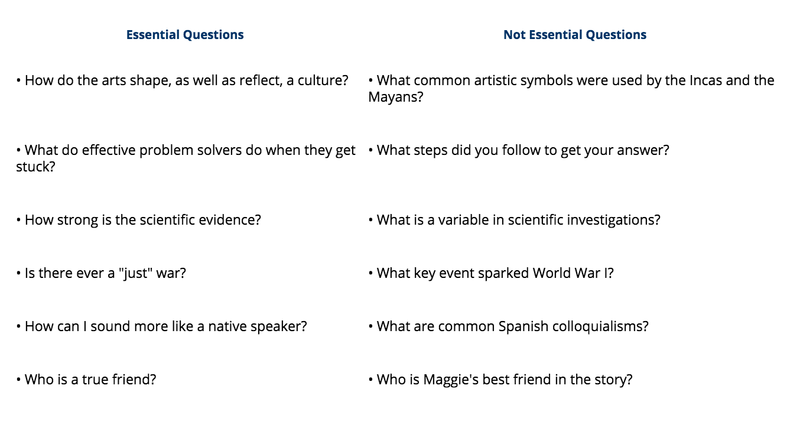 When working with teachers on crafting questions, this table – and the rest of the chapter it goes with – have proved immensely helpful. When students get accustomed to asking and answering these kinds of questions they are less afraid of being wrong. They are more curious and driven to find their own answers. Once your students have developed a personalized question, they need to decide how they can best share what they learn. When students create products that are worthy of sharing with anyone: parents, friends, the whole Internet... the quality of their work will improve because the feedback they get from others will matter more than grades. "It takes me around an hour to write a blog post, and I think it is good to publish worthwhile work to the public. Since my blog is public Mrs. Gallagher can share my work on Twitter, and other educators can see it. I have built a level of confidence that I think a lot of students deserve. When students in Mrs. Gallagher’s history classes publish work they are proud of, they are actually recognized for it rather than just getting a grade." Looking for examples of student work made from PBL experiences? Check out Tony Vincent's Learning in Hand website and his collection of PBL end products. Teachers should guide students toward products that will best demonstrate the answers they plan to find. For instance, if your students are investigating what drew European colonists across a treacherous ocean to settle the unknown Americas in the 17th century, perhaps a persuasive travel advertisement would fit. If your students are analyzing population and economic statistics, maybe they should create an infographic. You get the idea. 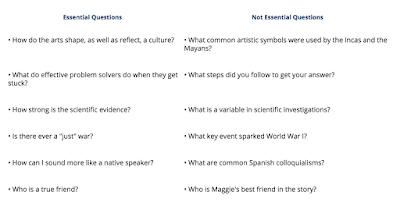 If your students are creating their questions and determining the products at the end, they should also have a hand in developing the benchmarks they reach along they way. Encourage them to plan their path to their goal. Help them mold that path into a rubric that will help them track their progress. I love this video from the Teaching Channel that explains how to help students use rubrics to self-evaluate their work, especially when they are in the middle of the process or have hit an obstacle. Self-evaluation helps them figure out how to move forward and reach their goal successfully. If the rubrics are made well, feedback is easy to give, everyone knows where they are on the path, no one is surprised by the final grade. 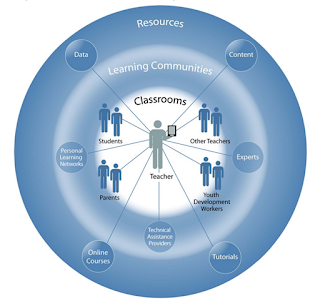 "Open Educational Resources (OER) are high-quality, open-licensed educational materials that are online. 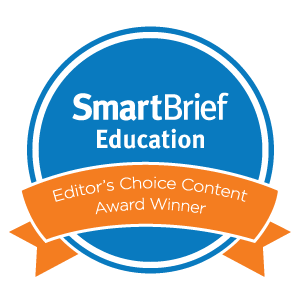 OERs are ideal for the classroom because, instead of working with pre-made resources that might not be a great fit, educators can hand pick the best content and activities just for their students." While textbooks are limited, expensive, and quickly out of date; OERs are free, available, and remixable. The Office of Educational Technology has even made openly licensed educational resources a priority with the #GoOpen initiative. 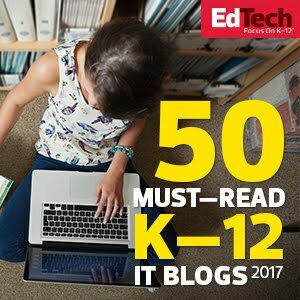 Help your students find the resources they need from this Edutopia Guide or the Learning Registry. Video chats have totally changed the way professionals connect with one another. It can also help our students connect with the best and the brightest in their area of research. In this post for Smarter Schools Project, I gave several examples of how my students used video chats to break down the walls of our classroom. Help your students reach out to researchers, executives, artists, scientists, and politicians. Since we can connect digitally, there are no limits to who your students can learn from. Now for more about that feedback. Rubrics aren't everything, relationships are. You know your students better than any rubric. Read their faces, listen in on their conversations in the classroom, and listen carefully to the insecurities in their questions. Feedback should be as much about encouragement as it is about constructive information. When you are in the classroom with your students and true student-driven personalized PBL is happening, there is almost no teacher-at-the-front-of-the-room stuff happening. This is a HUGE opportunity to just be with your students. Sit on the floor. Share your screen. Lean into a conversation. Point to something and compliment it. Ask a question. The more you are part of the process from start to finish, the more real your feedback will feel for them. If they know you are "in it" then they are more likely to listen and change based on what you say. Your feedback should be positive, specific, and helpful at every turn. As the school year comes to a close, educators should be confident in the skills and content they have helped their students master. 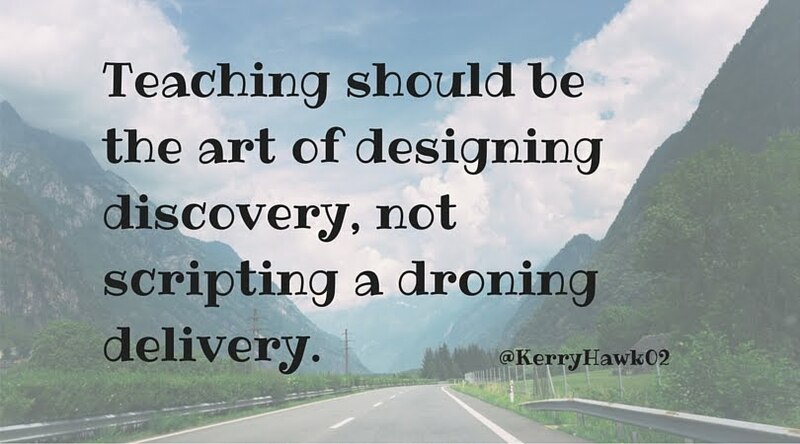 Give students a chance to put all of their new knowledge to work by letting them design and engage in a learning experience they create for themselves. Your students will certainly need your guidance and feedback, but they will be more invested and creative when driven by their own learning goals. 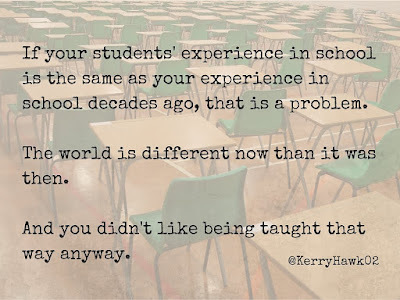 During my first year as a teacher, I taught the way I had been taught. It was tried and true. It had worked for me. I believed it was right. Generally, it worked OK.
After a year or two of relying on these methods, I reflected more on my students' experiences and my own experiences as a student. Students work hard. They listen intently. They take notes and try to understand. They do all of these until they feel overwhelmed and give up. Some give up quickly because they get overwhelmed quickly. They are sometimes labeled "lazy." Some only give up on certain classes or projects that put them over the edge. "I don't just want them to learn. I want them to want to learn." There is a difference. If our learners want to learn, they will dive deeper, think more, and be more creative. 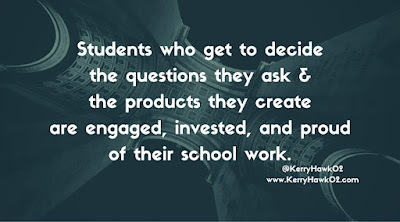 Instructional design, student voice, and questions that matter to students can make that difference. I was lectured to, took notes, practiced on worksheets, and then took tests. Sure, there were science labs, poster projects, oral presentations, and lots more. The few learning moments I had where I did something that was meaningful were incredible (one involved the song Jeremiah Was a Bullfrog), and are burned in my memory. There are only a few of those. Don't we want our students to have more than a few? 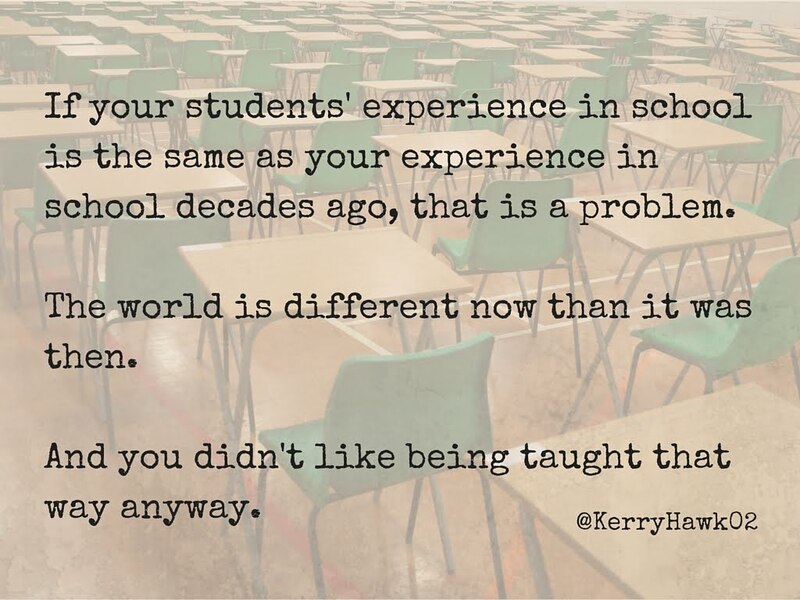 If your students' experience in school is the same as your experience in school decades ago, that is a problem. The world is different now than it was then. And you didn't like being taught that way anyway. We can do better. There are models. Don Wettrick created the Innovation Class model and has written two books with valuable stories and strategies from his experiences. His students are using their skills, knowledge, and creativity to design solutions that are important to them. The students come up with their own problems to solve, their own solutions, and it is all based in passion and Common Core. Not possible? Visit Don's site and see for yourself. In a recent segment on NPR, Nobel Laureate Carl Wieman, a Stanford professor, discussed his research on the effectiveness of "active learning" at the undergraduate level. Instructional design that gives students the opportunity to discover knowledge–rather than simply receiving a delivery from a professor–is gaining traction in higher education, too. In fact, Wieman said, "College lecture is the educational equivalent of bloodletting, one long overdue for revision." 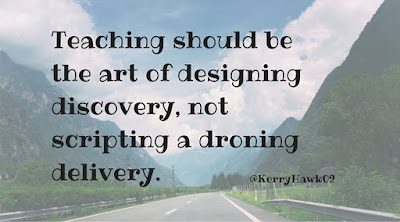 Teaching should be the art of designing discovery, not scripting a droning delivery. The evidence is published in books, presented at conferences, and backed up by research. While systematic change feels like moving the Earth, educators who can make grassroots change at the classroom and school level can build strength for the movement. As for me and my students, we made progress together. We did not make the transition to a text book free, test free, and paper free project based learning environment in one year. It took time and work, but it was worth it. No matter your role in education, you can contribute by taking a risk with your students. Teach the way you wish you were taught. 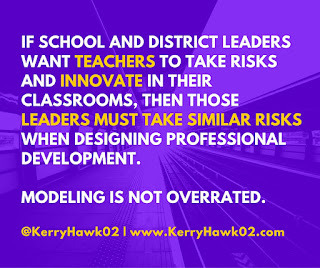 If school and district leaders want teachers to take risks and innovate in their classrooms, then those leaders must take similar risks when designing professional development. Modeling is not overrated. Let me repeat that: Modeling is NOT overrated. What follows is the If...Then of professional learning. If school leaders want teachers to be innovative, then they have to offer experiences that inspire innovation. Here are ideas that have worked, with concrete examples. IF we want teachers to try new tech tools and instructional practices, THEN give teachers a chance to try them out in context. Not as a special training. Teachers have grown tired of trainings that are focused on the latest app or shiny new tech tool. When one-to-one and bring your own device programs were first rolled out several years ago, many professional learning opportunities were modeled this way. Without putting teaching practices or learning goals first in professional development, apps and tech tools are like that pile of brand new toys a week after Christmas: They get left behind and teachers return to old habits. 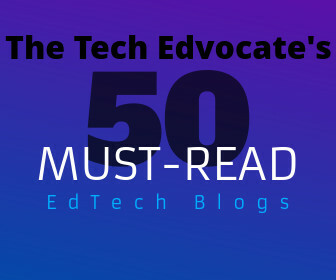 Instead, the teaching and learning that these technology tools help promote should be modeled within professional development. For example, my colleagues Julie Cremin, Elizabeth Solomon and I facilitated professional learning on digital citizenship last summer. 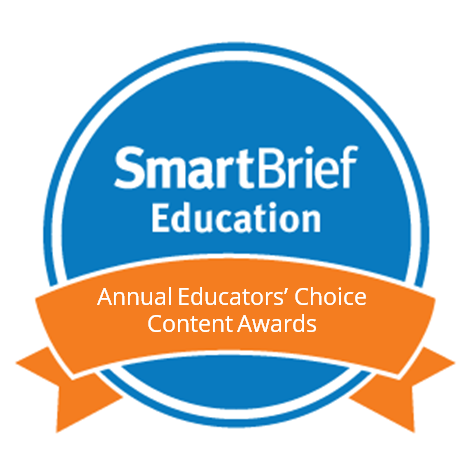 To kick off our time together, we asked teachers to watch some short video clips, read excerpts from websites and articles, and then they used Socrative, a digital formative assessment tool, to share their thoughts and vote on their colleagues' responses. What followed was not surprising. Over the course of this school year, teachers from all grade levels and departments have approached us to learn more about Socrative and have been using it regularly in their classes. Even teachers who could not attend that summer training have heard about how Socrative can help them track student learning and even give quick quizzes without increasing their correcting load. Formative assessment has become such a regular practice in some classrooms that it was featured in the school's biannual magazine recently. The professional learning teachers experienced was not about a tool. Instead the tool and teaching practice were embedded into professional learning so teachers could experience them from the student perspective. This is how new tools and practices can gain real traction. IF we want teachers to collaborate and co-plan more, THEN give them time and space to talk about the topics they care about with an EdCamp. School day scheduling often limits teachers' abilities to co-plan and collaborate. Weekly department or team meetings do not provide enough time to develop an idea, create a plan, and carry it out together. If school leaders utilize professional learning time to help facilitate these conversations and collaborations, teachers are more likely to actually follow through. I recently participated in two Edcamps–one in Boston and the other at Stanford University–and had the opportunity to learn with and from Hadley Ferguson, Executive Director of the EdCamp Foundation, at both. At Edcamp Boston the enthusiastic participants jumped right in. Most of them were classroom teachers and were hungry for the opportunity to share ideas and have conversations with their colleagues from around the state. At Edcamp Redbird the participants were mostly district leaders and the majority had never experienced the Edcamp model before. This crowd was more hesitant and had a lot of questions. Hadley gracefully encouraged them to jump in and give it a shot with open minds. Even though the Edcamp was the second half of a packed day, the energy was electric. My colleagues in Massachusetts, Henry Turner and Lisa Morrison, have successfully implemented an Edcamp style professional learning experience with their teachers at Bedford High School. The vast majority of their teachers had never been to an Edcamp before, but it still worked in their school. 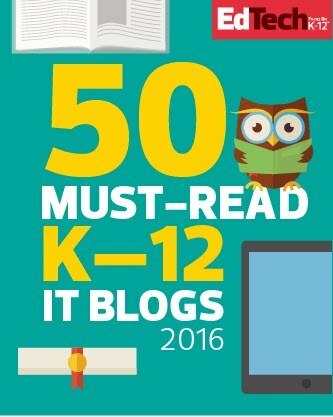 They presented about it at MassCUE, our state conference, and have lots of resources to share. In all cases, the educators–both administrators and classroom teachers–experienced the professional discourse they craved and left with ideas to run with. It can be done, even with an inexperienced faculty. Just take the leap. IF we want teachers to contribute to a positive school culture, THEN publicly praise both individuals and groups when they do teaching and learning well. There are easy ways to promote positivity by highlighting the great work among teachers. At Reading Memorial High School, where I worked as a history teacher, we gave "kudos" to our colleagues at the last faculty meeting of the year. This meant we lifted up and brought attention to the little-known but impressive work of our fellow teachers and symbolically gave them a Kudos granola bar as well. It was super cheesy, but was also usually one of my favorite moments with my colleagues. I often wished we did it every faculty meeting, not just once a year. Instant posts of photos snapped in classrooms on Instagram, Twitter, or Facebook to highlight what is happening in classrooms. More detailed posts that are planned/storyboarded/edited on podcasts, blogposts, or newsletters. Whether it done within a school or publicly on social media, teachers do not expect to get praise for the day-to-day. When they do it is special, and it motivates them to make every day special. They will feel uplifted and will be more likely to lift others–their students and colleagues–up. IF we want teachers to give students more hands-on learning experiences, THEN we need to give them more hands-on learning experiences. What is “sandbox time”? Simply put, it’s giving the group time to play. Time to explore, talk, and get comfortable. Time to discover and create new ideas. In our co-authored post for EdSurge, Five Ways to Create More Teacher Rockstars in Your School, we talk about the value of hands-on time. Teachers crave time to talk, tinker, and plan. When planning professional development, use the 80-20 rule: 80% of time dedicated to hands-on time, 20% of time dedicated to the welcome, intro, and wrap-up. The bulk of learning happens when we are processing, communicating, and applying knowledge. Very little happens during "sit and get" experiences. Make sandbox time a priority. IF we want teachers to stay up to date with how their students think and communicate, THEN open the door to student-led PD. The latest evidence that student-led professional development is necessary is the burgeoning presence of Snapchat on the education scene. None of us are sure what role Snapchat will play, but it has incredible potential and the majority of our adolescent and teen students are active users. Patrick Larkin, Jenn Scheffer, and their students at Burlington High School are leading the way with the BPS Snapchat account. U.S. News and World Report has discussed example cases of successful uses in schools. Spreading news through Snapchat isn't limited to the K-12 scene. Colleges are dipping their toes in as well. In all cases, the reasons there is traction is because of the input from students. There is a reason the student innovation course, pioneered by notable educators like Andrew Marcinek and Don Wettrick, are gaining traction all over the country. Through these models, students are able to articulate to their teachers, parents, and peers about how they like to learn. Many schools have gone a step further and have offered student-led professional learning. Check out examples here, here, and here. Educators are undoubtedly content and instructional experts, but our students are the experts on what videos, apps, and ideas are capturing their attention. If we can leverage that information to hook them into their academics, why wouldn't we? Each of these solutions requires school leaders and district facilitators to take risks with precious professional learning time. Remember that teachers are asked to take risks with precious class time throughout their careers. The best approach is to be up front. Tell teachers that this is an experiment based on research and examples from other schools. Tell them that open minds can lead everyone in the right direction and that everyone involved will be reflecting on the process at the end. Teachers are accustomed to asking their students to take similar leaps to faith. It will be familiar territory. 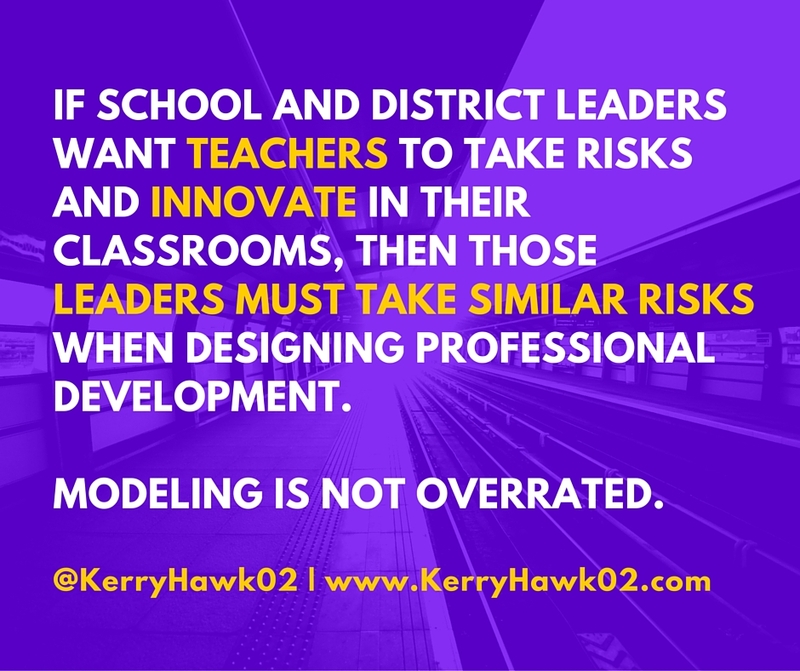 If we are asking teachers to be innovative in their classrooms, we need to help them experience these models themselves. These five solutions are a start.